Well, the time has come for my first EV project! I really wanted to convert the Toyota Paseo I picked up a while ago, but it would have cost too much for me at the moment. So, my next thought was that I really could use a riding mower. I have push mowed my lawn, and it takes a long time. So, I talked things over with Ben Nelson and MetroMPG, the two EV guys I know and decided to go with an electric riding mower. This weekend I picked up a Simplicity 728 (no idea what year) from a very kind gentleman. 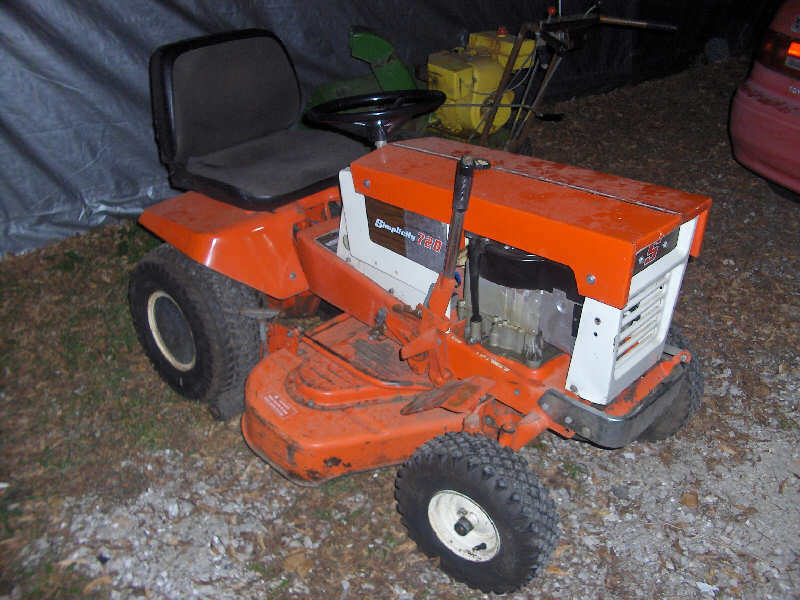 I found and got the mower for free using FreeCycle.org. It currently has a mildly used 8hp Briggs engine in it. The deal with the donator was that I take the engine out and return it to him since it hasn't seen much use. I was all too happy to oblige! So, now I have a new project for this winter. Hopefully updates will come fast. Last edited by Daox; 05-08-15 at 10:26 AM.. This sounds like fun. I'm interested to see how everything goes for you to see what I can apply to my electric push mower conversion that I hope to have finished before spring. Be sure to take a lot of pictures! Now that you've got a project like this, I will be following along closely. Please take pics, and If I can help with researching info please let me know. Not that I could compare to Ben or MetrMPG, those guys are awesome! I can't wait to see the progress! Well, I took the mower out for a spin last night. I really needed to cut the grass and chew up the leaves. So, the mower got its last run on gasoline. It worked quite well for what I seemed to think of as a small mower (only 8 hp). I'm now starting to track down the necessary other items for the conversion. Ben Nelson said he would donate a few things so I'm really psyched about that! There will be many pictures to come. cool idea! what kind of range do you think you'll get? I'm going to start with humble targets. I'd like to be able to mow half of my yard on one charge. Below is a pic of the two 'halfs'. I actually think, depending on the quality of the batteries, that I should be able to do the entire yard. However, I'll be fine if I can't do the entire thing all at once. Last edited by Daox; 02-27-09 at 02:25 PM..
Wow, Tim, that's a really nice spread you got there. 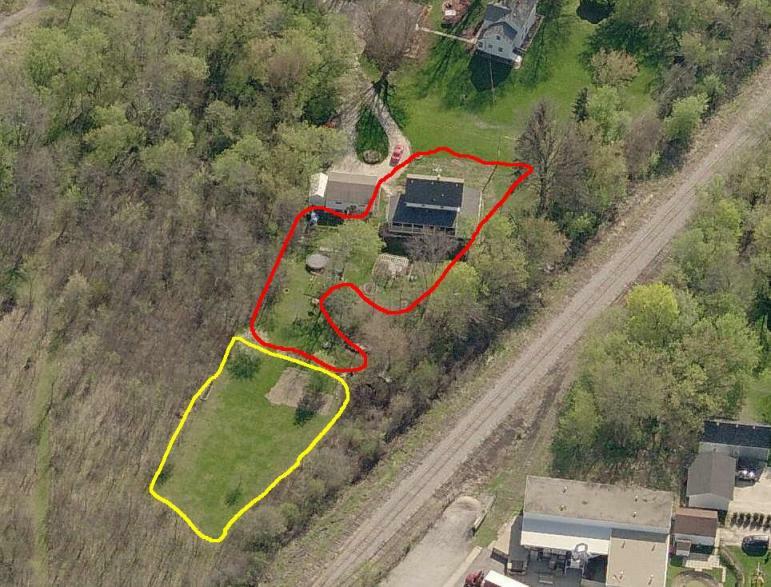 Is the white structure by the cul-de-sac yours, too? I am also very excited to see your rider conversion as it progresses. I have been thinking about doing the same, but have not committed to it...yet. And yes, post lots and lots of pictures! any progress on the mower Daox? Yes: I reneged on a free motor controller I offered to send Tim. OK, technically Ivan reneged, since it's half his I suppose. Sorry!